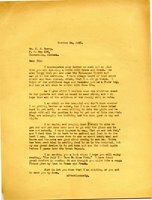 Martha Berry sends a letter to her brother Ike thanking him for the letter he sent to her in the hospital. She reminisces about their childhood and mentions her sisters and niece visiting her. She wishes to get better so that she can return to her school.